David Adkins will appear in Thoreau or, Return to Walden. In revealing the additional plans (she announced the main stage shows in February) Maguire says “We are teaming up with some of the most exciting voices in American Theatre: director Jackson Gay, BTG artist Keira Naughton and playwright Suzanne Heathcote to present the world premiere, I Saw My Neighbor On The Train And I Didn’t Even Smile. We are delighted to partner with New Neighborhood on this funny and insightful look on a very contemporary, dysfunctional American family. Last year, we presented the great literary figure, Poe, and this year, we are presenting the great American philosopher, Henry Thoreau. Written by and starring the remarkable David Adkins, Thoreau or, Return to Walden honors an incredible dramatist who had a significant impact on the way Americans think. Eric Hill will be directing this world premiere where we’ll all have the chance to return to Thoreau’s utopia—Walden. Berkshire Theatre Group’s 2015 season also brings legendary rock and folk musicians, famed artists and fun community events to the Berkshires. Music performances on the Colonial stage include American folk music icons The Kingston Trio, timeless rock legends America and folk legend Arlo Guthrie’s Alice’s Restaurant: 50th Anniversary Tour which was previously announced without a date. Arlo will play the Colonial on Columbus Day weekend; October 11 at 7pm. Comedy on the Colonial stage includes Last Comic Standing comedian, Ralphie May and mixed media comedian, McQueen. Comedy at The Garage features a brand new Wednesday Night Comedy Series. Wednesdays at The Garage will often feature evenings of knee-slapping comedy. Comedians scheduled to perform at the Wednesday Night Comedy Series will be announced at a later date. Music at The Garage features American Idol contestant and Berkshire native, Katherine Winston. Debuting this year at The Colonial Theatre is the On The Stage Series. This special Series gives audiences the opportunity to see their favorite artists, such as pianist and composer, Robin Spielberg, up close and personal, on the historic Colonial stage. Berkshire Theatre Group Programmer, Simon Shaw, says, “Sitting on the Colonial stage, looking out at the beautiful theatre as you watch the artist performing right in front of you is an unforgettable and amazing experience.” A full lineup of artist scheduled to perform at the On The Stage Series will be announced at a later date. Community events at The Colonial Theatre include BTG’s second annual Encore! An Evening to Celebrate High School Musicals directed by Travis G. Daly. This special performance features ten-minute encore performances from this year’s Berkshire County high school musicals. A brand new music review, Metamorphosis presents: Evolution of Music, from the Producers of Romance, Soul & Rock N’ Roll. The 11th annual Pittsfield CityJazz Festival featuring Greg Hopkins Jazz Orchestra, with guest soloist Randy Brecker on trumpet. This fall marks the 5th anniversary of Berkshire Theatre Group’s festival of new works, Made in the Berkshires, celebrating the talents of Berkshire County with a juried selection of events that present the best in the local arts. Many events in BTG’s 2015 Season were previously announced in mid-February, including, Bells Are Ringing, Deathtrap, Frankie and Johnny in the Clair de Lune, Mary Poppins, BoDeans, Natalie MacMaster and Robert Klein. Tickets are now on sale. Summer season passes are available for purchase at $125 for a four-show pass, and $175 for a six-show pass, $100 for a four-show preview pass, $120 for a six-show preview pass. BTGy is a youth outreach initiative for theatre-goers 25 years of age and younger to experience the joy and wonder of live theatre and the performing arts on our stages. Tickets to BTG’s summer theatre productions for ½ of a regular priced ticket and 10% off BTG’s presented shows (some restrictions apply). To join BTGy please contact the BTG Ticket Office at 111 South Street, Pittsfield by calling 413-997-4444. Tickets for BTGy are subject to availability and proof of age. Tickets may be purchased in person at the Colonial Ticket Office at 111 South Street, Pittsfield, or by calling (413) 997-4444, or online at www.BerkshireTheatreGroup.org. The Ticket Office is open Monday-Friday 10am–5pm, Saturdays 10am–2pm or on any performance day from 10am until curtain. All plays, schedules, casting and prices are subject to change. Inspired by incomparable dramatist Anton Chekhov’s The Seagull, Justin Scheuer, Artistic Director of The Classical Edge Theatre, explores new territory in, Masha’s Seagull. Directed by BTG artist Eric Hill, this production takes on Chekhov’s classic work, and examines a minor, yet intriguing, character in the original story, Masha, played by Virginia Scheuer. This insightful production premiered at The Classical Edge Theatre last fall. New England Transcendentalist, poet, and philosopher, Henry David Thoreau, built his life around the idea of simplicity and love. The enlightened thinker’s reflections come to life in the world premiere of David Adkins’ one-man play, Thoreau or, Return to Walden. 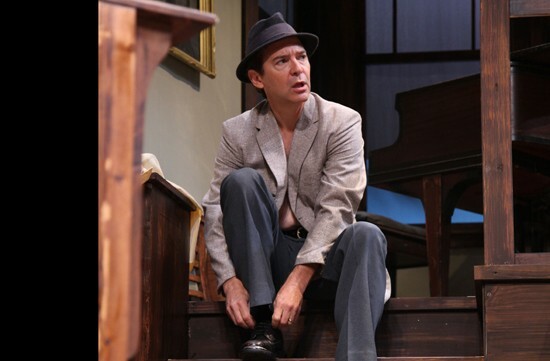 With 22 seasons at Berkshire Theatre Group under his belt, Adkins has been in BTG productions including: Poe, Benefactors, Same Time, Next Year; Homestead Crossing; Sylvia and Faith Healer. Long-time BTG Artist, Eric Hill, who most recently wrote and directed Adkins in the wildly well-received Poe, will direct this production. Hill has directed numerous shows at BTG, including: The Who’s Tommy, A Chorus Line, Oklahoma! and the annual classic, A Christmas Carol. How do you find genuine human connections in today’s ever-changing, technology-driven culture? This question sets the tone in, I Saw My Neighbor On the Train and I Didn’t Even Smile, a new play by Suzanne Heathcote, directed by Jackson Gay, making their BTG debuts. The world premiere, co-produced by New Neighborhood, features longtime BTG artist Keira Naughton, who most recently directed the world premiere of Cedars, starring her father James Naughton; Linda Gehringer and Adam O’Byrne, making his BTG debut. After yet another incident at school, Sadie, a clever teenager with a hard exterior, is sent to stay with her estranged father, Jamie, a struggling music producer. Already weighed down with personal matters, Jamie guilts his neurotic, naïve sister, Rebecca, played by Keira Naughton (Birthday Boy, Macbeth, Faith Healer, The Book Club Play) into watching Sadie. Plagued by her overwhelming, cynical mother, Daphne, played by Linda Gehringer (The Crowd You’re With, How to Write a New Book for the Bible), Rebecca reluctantly invites Sadie into her secluded life. As each character’s carefully constructed layers unfurl, they are forced to step out of their comfort zone, and embrace life’s blemishes. About New Neighborhood: Born out of the Low Brow/Hi Fi 2014 Yale Rep production of These Paper Bullets! and the unintended financial backing of Rupert Murdoch, New Neighborhood is a theater and television company whose sincerity and authenticity are so combustible, it cannot be housed under one roof for too long without doing severe structural damage. With new work, bruised work, all-singing, all-dancing, foul-mouthed musical work, New Neighborhood seeks to harvest the organs of its audience and sell them back to their owners within the time houselights dim and houselights rise. Founded in 2015 by a collective of artists scattered across the country, New Neighborhood is a particular ordinance of Actors, Designers, Directors, Dramaturgs (all the hot D’s! ), Musicians, Graphic Novelists, Producers, Writers, Widows, Widowers (all the lousy W’s) and bad, browned-on-both-sides Balladeers. New Neighborhood finds a show, produces the sh*t outta it, and disappears into a cloud of train smoke. Searching For The Moon: A Heroine’s Journey is a one woman show written and performed by Amber Chand. This powerful show depicts acts and tales of love, despair, faith and forgiveness. Director Jayne Atkinson and Amber Chand promise to create an unforgettable evening of one woman’s global journey of heroism. Written by Nobel Prize-Winning British playwright, Harold Pinter, The Homecoming, is a thought provoking, noteworthy piece of theatre. Eric Hill, respected BTG artist—who so diligently directed Benefactors last year—directs this Tony Award-winning play. This production features three-time OBIE Award-Winning television, film and stage actor, Rocco Sisto and notable BTG Alum, Tara Franklin. The Homecoming invites audiences to delve deep into hidden crevices of the human condition. Philosophy teacher, Teddy, brings his wife of six years, Ruth, played by Tara Franklin (Lion in Winter, Equus, The Einstein Project), to his childhood home in North London to meet his family after a long estrangement. Without warning of their visit, Teddy and Ruth are greeted by Teddy’s domineering family; Teddy’s aggressive father, Max, played by Rocco Sisto (Quills, Seminar, Amadeaus) Max’s younger, incompetent brother, Sam; and Teddy’s two brothers—Joey, an aspiring boxer and Lenny, an amateur hustler. Teddy and Ruth’s homecoming instigates a power struggle for the ages, and family ties begin to unravel.